Place your cursor on a particular crosshair and click to be taken to mission stats below, or CLICK HERE for discussion of Martian topography. The color scale bar on the left indicates altitude (blue/purple = lowest, light gray/white = highest, yellow = datum). Upper stage? (SL-6 Molniya) exploded in earth orbit 29Oct1962, probe reentered 29Oct1962. Contact lost @ 106,000,000 km enroute to Mars. Failed to make earth orbit (SL-6 Molniya), reentered 05Nov1962. Shroud failure prevented flyby, in solar orbit. Returned pictures during flyby on 14Jul1965 @ 9789 km, in solar orbit, telemetry ended 20Dec1967 (micrometeoroids?). Contact lost enroute to Mars. Returned 75 TV pictures during flyby on 1Jul1969 @ 3392 km over equator, in solar orbit. Returned 126 TV pictures during flyby on 05Aug1969 @ 3504 km over southern hemisphere, in solar orbit. 2nd stage (SL-12 Proton) failure. 1st stage (SL-12 Proton) failure. 2nd stage (Atlas-Centaur) failure resulted in thalassosynchronous (Atlantic Ocean) orbit. 3rd/4th stage (SL-12 Proton) separation failure in earth orbit, reentered 12May1971. Orbiter: entered 1380 km × 25000 km × 49 ° Martian orbit on 27Nov1971, returned data for months. Lander: First human artifact on Mars; crashed 27Nov1971 at 44 ° South x 149 ° East northeast of Kepler Crater. Return to Mars topo map. Orbiter: entered 1530 km × 214500 km × 60 ° Martian orbit on 02Dec1971, returned data for months. Lander: First human artifact to soft land on another planet; landed 02Dec1971 at 45 ° South × 158 ° West near Ptolemaeus Crater, failed shortly later (20 min.?). Return to Mars topo map. Entered 1394 km × 17144 km × 64 ° Martian orbit on 13Nov1971, returned many pictures. Flew by Phobos and Deimos. Last tx 27Oct1972. Note: The Soviets split the Mars 4 - 7 missions into four separate Proton launches instead of their customary twin launch due to mass limitations imposed by the unfavorable Earth-Mars geometry during the 1973 launch window. All four missions were doomed by flawed onboard computer chips but were launched anyway in attempt to beat the US to the surface of Mars. See also Mars '73: Learning from Mistakes by Ted Stryk. Failed to enter Mars orbit due to fuel leak, but returned one swath of color pictures of southern hemisphere and some radio occultation data during flyby on 10Feb1974 @ 2200 km. Now in solar orbit. Instruments: spectrometers, cameras, radio relay for Mars-6 lander. Orbiter entered 1769 km × 32560 km × 35 ° Martian orbit on 12Feb1974, but failed after 22 orbits due to depressurization of instrument compartment. Although it returned some hi-res color pictures and other data, it fell so far short of its objectives that this mission, indeed the whole campaign should be counted as a failure. Instruments: spectrometers, cameras, radio relay for Mars-7 lander. Flyby bus in solar orbit. Bus instruments: A few remote sensors. First direct weather report from Mars. Lander returned some noisy atmospheric data during descent 12Mar1974; retrorocket failure followed by crash at 23 ° South x 25 ° West, south of Margaritifer Sinus. Instruments: television camera; mass spectrometer; soil & atmosphere composition tests; wind, temp & pressure measurement.Return to Mars topo map. Flyby bus with lander in solar orbit. Bus instruments: A few remote sensors. Maneuvering failure, onboard systems failure, missed Mars 06Mar1974? Instruments: television camera; mass spectrometer; soil & atmosphere composition tests; wind, temp & pressure measurement. Launch failure (Titan IIIE-Centaur). Counts as attempt or mission? Orbiter into Mars orbit 19Jun1976, died 07Aug1980, reentered 19Nov1985. Lander set down 20Jul76 at 22 ° North × 49 ° West in Chryse Planitia, tested soil for life, died 13Nov82, both highly successful. First successful landing on Mars. Return to Mars topo map. Orbiter into Mars orbit 07Aug1976, died 25Jul1978, reentered when? Lander set down at 03Sep76 at 46 ° North × 137 ° East in Utopia Planitia, died 12Apr1980; both highly successful. Return to Mars topo map. Contact lost 29Aug1988 enroute to Martian moon Phobos due to controller error , flew past Mars. Orbiter and ADU penetrator entered 6145 km × 6409 km × 1.3 ° Mars orbit on 31Jan1989, contact lost 18Feb1989 due to controller error?, some data returned 100 km from Phobos. Additional reading on the Russians' bad luck can be found at: "The Rocky Soviet Road to Mars", EJASA, October 1989 by Larry Klaes of the Boston NSS chapter. Contact lost, fuel line exploded? at Mars orbit insertion burn 21Aug1993, flew past Mars. 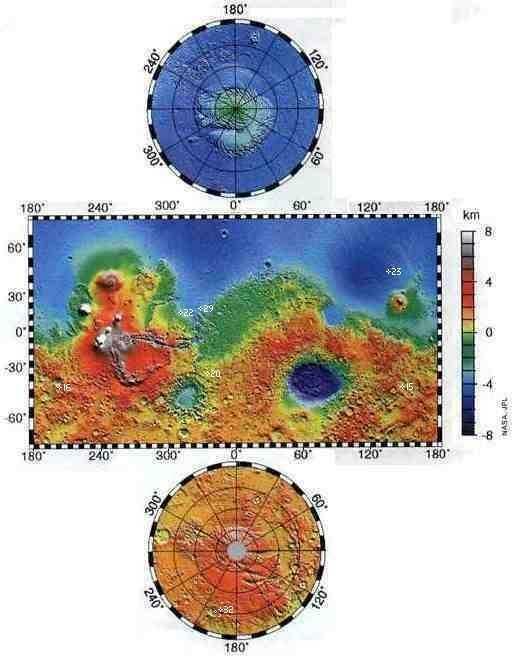 Entered Mars orbit 12Sep1997, aerobraking into polar sunsyn mapping orbit was delayed till 01?Nov1998 due to bent solar array, MOLA instrument returned hi-res 3-D map of Mars, currently working. See discussion of MOLA results below. Upper stage failure in earth orbit (SL-12 Proton/Blok DM); orbiter, 2 landers, 2 penetrators and upper stage reentered within one orbit; either it sleeps with the fishes (in Pacific Ocean) or with the llamas (crashed in Bolivia)? Direct descent via aerobraking, parachute, retrorocket and airbag, landed on Mars 04Jul1997 at 19.4° North × 33.5° West near mouth of Ares Vallis, airbag landing system worked, renamed Sagan Memorial Station, returned 16,500 pix and data, last tx 27Sep1997. Sojourner rover worked, traversed 106 meters, returned 550 pix & chem analyses, last tx 06Oct1997. Return to Mars topo map. Orbiter flew Mars by 4 years due to wrong burn during slingshot by Earth. Abandoned 09Dec2003. Burned up 23Sep1999 during excessively steep reentry into Martian atmosphere caused by cumulative navigation error. See what happens when you don't check your units? Contact lost 03Dec1999, failed due to probable premature engine cutoff during landing. Cruise ring in solar orbit. Amundsen, Scott (DS2) penetrators also failed to separate from bus? or did cables between fore and aft halves break? The large and small crosses in the southern hemisphere mark the intended touchdown coordinates: 76° South x 195 ° for the lander, 75° South x 196° for the penetrators. The white tick marks define the upper and lower boundary of the 200 km x 20 km landing ellipse. Return to Mars topo map. Mars Odyssey (Mars Surveyor 2001) - USA 07 April 2001 on Delta II. Orbiter entered Mars orbit 0218 24Oct2001. (Lander portion of mission was cancelled after MPL failure.) In 2-hour 99 km Ø 2951 km Ø 93° mapping orbit. Mars Express - ESA/UK/Russia 02 June 2003. Lander separated from orbiter, entered Martian atmosphere @ 0247 UTC, enroute to airbag/chute landing in Isidis Planitia ? ° × ? ° East @ 0252 UTC 25Dec2003. Not heard from since. Return to Mars topo map. Mars Exploration Rover Spirit (Athena #1) - USA 10 June 2003. First of twin heavy 136 kg rovers launched on separate Delta IIs. Separated from cruise stage @ 0405 UTC 04Jan2004; lander bounced (airbags) inside Gusev Crater at ? ° × ? ° East @ 0426. Site renamed Columbia Memorial Station. Commenced roving 15Jan2004; 100 m/day for 3 months. Primary mission complete. Extended mission in progress. Mars Exploration Rover Opportunity (Athena #2) - USA 08 July 2003. Separated from cruise stage@ 0433 UTC 25Jan2004; entered atmosphere @ 0449; lander bounced (airbags) inside Meridiani Planum, at 2° South × 354° East @ 0454. Site renamed Challenger Memorial Station. This is a bit of a cobwebpage; fresh updates and news coming soon.Return to Mars topo map. Click here for status of rovers. Note: As with the Luna list, after much thought, I decided I shall include in this population any future missions which take place in LEO but are solely dedicated to promoting Mars exploration. Space physics experiments of broad applicability (e.g. radiation measurement, magnetic mapping) are not included for the same reason. Multiple visits to the same body by the same spacecraft (e.g. GEM) do not count as multiple missions (even if they do require multiple visits to Capitol Hill for funding). Multiple visits to different primaries do. A mere gravity assist maneuver without science return doesn't really count as a mission, either - a "flyby" requires at least one instrument to be pointed in the general direction of the celestial body. This was not an accounting issue until a few Big Science missions (e.g. Galileo, Project Vega) flew some very complex trajectories with multiple gravity assists. Credit goes out to TRW Space Log 1957-1996, The Planetary Report published by The Planetary Society, Proton Mission Planner's Manual, Jonathan's Space Report, and Chris Jones: clj@world.std.com. Many thanks to Marc Rayman at JPL for constructive criticism. A tip o' the dust visor to David Portree DSFPortree@aol.com for his sharp editorial eyes. Mars Micromissions - USA/ESA 2003+. Streamlined100 kg science missions on direct trajectories to Mars, reentry via airbags, piggybacking on Ariane 5 boosters per space available basis. Possibly six micromissions per year. Mars Reconnaissance Orbiter - USA 2005. Heavy orbiter to supplement Global Surveyor database with close looks at 20-30 cm resolution. mission name? - France/Euro consortium 2005. Orbiter and 4 "Netlanders". Phobos Grunt - Russia circa 2005. Sample return from Phobos. Funded. mission name? - Russia when? Mars rover. Mobile Science Laboratory - USA 2007. Scout-class missions - USA 2007+. Small competitive missions (rovers, landers, fliers). Sample return #1 - USA 2011-2014. Lander and rover with 500 gram sample return to Earth. Rendezvous with French orbiter? Delayed and rescoped as result of MPL failure. Prototype in-situ propellant production plant delayed? first manned mission to Mars? - 14 January 2014 +/- few days. If a mission like this is going to happen, this is the best window for manned landing attempt having emergency free return (such as Apollo 13 was able to utilize). Russia has also proposed a manned mission to Mars by 2020. Sample return #2 - USA 2016. Lander and rover with sample return to Earth. Rescoped as result of MPL failure. All written email addresses on these pages have been modifed in ways to defeat spammers' spiders, but hopefully easy for the reader to understand. These pages last updated November 13, 2005.